Cancellation policy: 48h before arrival. In case of a late cancellation or No Show, you will be charged the first night or 50% if the reservation is longer of your stay. Cash and credit cards (a fee charge will apply 5% with credit card and debit card) accepted upon arrival. Sometimes the owner gift basic dinner. I cant say eniugh about how wonderful this place was. 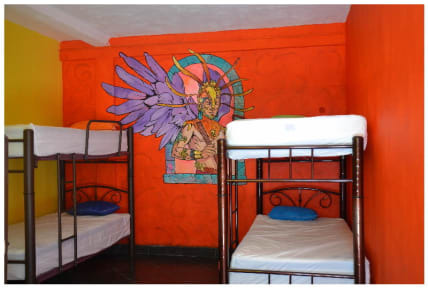 I recimmend this hostel yo anyone staying in Cancun. Staff were the best ever. Epic breakfasts and dinners and very friendly and helpful. Can't wait to come back. Staff were super fun, friendly and helpful! Cool vibe, easy to meet people. Bed was comfy and the food was good. I was only there one night, I wish I could have stayed longer. Great place! The staff really make it amazing as well as the yummy breakfast. I've already booked again for my way back! Great place! Very hospitable staff. The breakfast was amazing and we even had free pasta for dinner. I‘d highly recommend staying there. Good location and good value. We stayed in the air conditioned private unit, and it was nice and cool, but the air conditioner was pretty loud. Staff were great. We arrived around 7:00pm and had no issue getting our room, but we also emailed ahead of time with our arrival time (but did not get a response). Just a note about Cancún in general: plumbing/sewer is not great and many places you go ask that you not flush toilet paper. 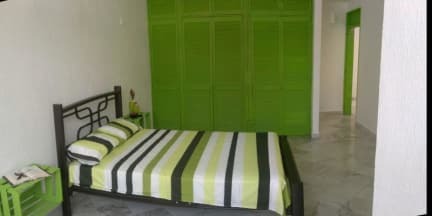 Hostel included. Is an excellent place for backpackers! Breakfast is freee and dinner too. Only stayed here one night. It was ok for a stop over from the airport, to rest before moving to my main destination, but I wouldn't have wanted to have stayed longer than that! About 15 minute walk from main ADO bus station from the airport but far from the beach area and not much to see in Cancun, which as a place I wouldn't recommend at all! Breakfast was very good though.